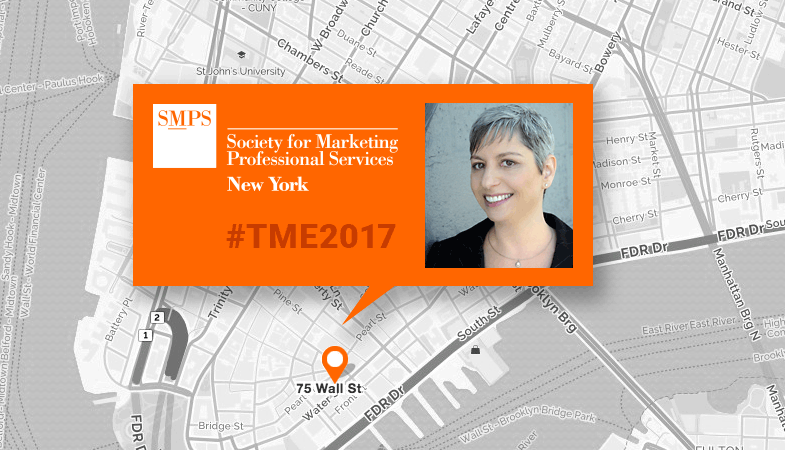 Once again, Ida Cheinman returns to TME – SMPS New York’s Annual Marketing Conference (The Marketing Event). Omnichannel marketing remains one of the hottest and often confusing topics, but it’s also a model that promises to fundamentally change the way professional services firms see and do marketing. In the world where everything starts online and 67% of the buyer journey is completed prior to first contact, empowered B2B customers demand customer-centric and a fully seamless experience, regardless of the channel, location or device. While the promise of omnichannel is exciting, putting it into practice is not easy. It requires new knowledge, skills and technologies and perhaps, most difficult of all, a fundamental shift in how we see and do marketing. So where do you start with this new approach that spans technology, marketing, company culture and more? This session will demystify the concept of omnichannel by breaking it down into a series of practical concepts and showing how to incorporate omnichannel marketing into strategy, planning and the daily operations of A/E/C firms. THE Marketing Event is a day-long professional development symposium designed to help A/E/C marketers further their skills and advance their careers. TME 2016 is focused on delivering content that is most relevant to today’s professional services marketing and it promises to provide actionable and compelling takeaways to help you change the game.